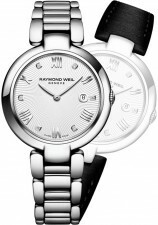 Inspired by the world of ballet and made exclusively for women, the Shine collection is a particularly beautiful pas de deux between Raymond Weil and Paris-based luxury and ballet goods company Repetto. This collection features a unique, patented interchangeable bracelet system, offering women the freedom to reinvent their style as the occasion demands. Choose from interchangeable metal bracelets in plain or two-tone stainless steel. Or opt for the straps crafted from Repetto leather in the blush colors of pointe and demi-pointe ballet shoes. Spoil yourself with watches that feature white mother of pearl dials studded with diamonds. Shine is all about fluidity and movement, elegance and grace. Take centre stage and give the performance of your life. Choose a timepiece from the Shine collection.